Hello! My name is Mrs. Kelly Wooten and I teach Kindergarten at Bethalto East Primary. This is my 18th year of teaching. I graduated from SIUE in 2001 and then received master's degree in educational administration from SIUE in 2004. In 2007, I certified as a National Board Certified Teacher in Early Childhood. I am married to my wonderful and supportive husband and we have two sons, Zachary, 13 and Garrett, 9. My hobbies include shopping and spending time with my family and friends. I am looking forward to having a great year with your child. Together we CAN and WILL make a difference. Remind is a great way for you to remain informed about classroom information. 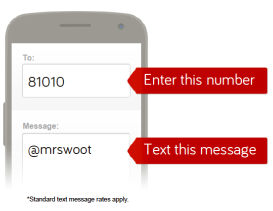 By texting the number to the right with the message @mrswoot, you will be subscribing to this form of communication. Once you subscribe, I can send you texts about school events and reminders. I encourage you to take the time to do this. I am able to send a mass text to all members. Thanks! !